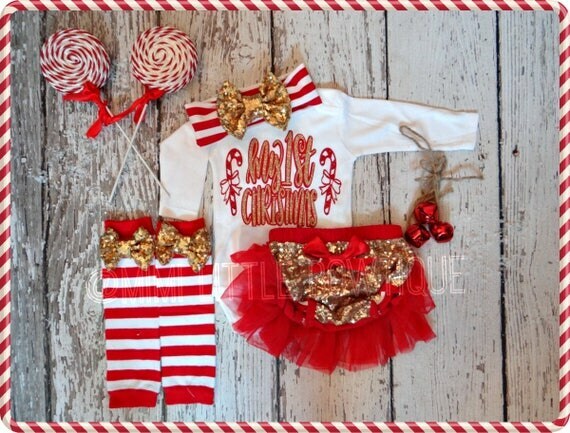 Baby girl Christmas outfit with glitter design. We use a premium bodysuit and tshirt with an elegant scallop trim on all the seams. Our bodysuit & shirt is loose fitting and extremely soft. The bodysuit and glitter are CPSIA CERTIFIED; the glitter will not flake, rub or peel off. 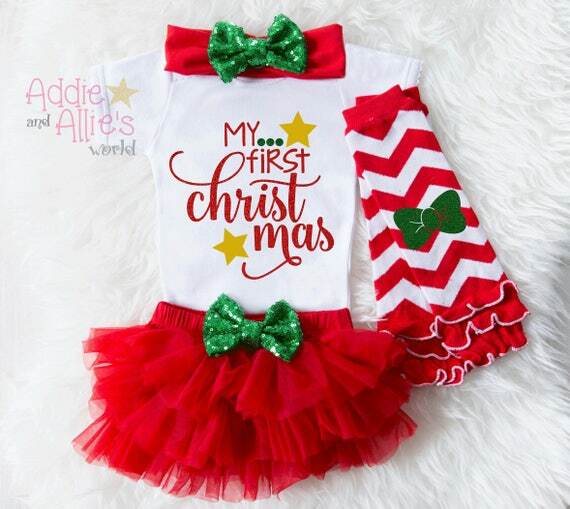 This is a beautifully handcrafted baby girl Christmas outfit that is sure to provide your little one with plenty of style and compliments! We offer various styles of baby girl clothes that are absolutely original and unique! This stylish onesie is perfect for your little girl’s first Christmas, a cute photo-shoot or even a baby shower gift! Be sure to check out all of our baby onesies to choose what best fits your style! 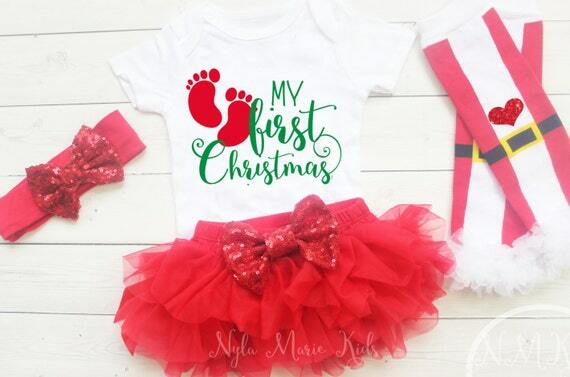 This design reads as “My first Christmas” and is embellished with red and gold glitter heat transfer vinyl. What a gorgeous outfit to wear this Holiday season! This is perfect for holiday parties, Santa visits, Christmas day, and other holiday events and celebrations you may have planned this year! This outfit is all that you need for BEAUTIFUL holiday pictures! I have embellished this bodysuit with a gorgeous red glitter heat transfer vinyl. I made the headband from a gorgeous green satin elastic and adorned it with red and green flower embellishments and then topped it off with a gorgeous gem. Please note that headbands contain small parts and are a choking hazard. Please do not ever leave your child unattended with the headband or any of it’s parts. The bloomers are made with a gorgeous red and green satin fabric. I adorned the bloomers with a beautiful satin red ribbon which I embellished with a green glitter heat transfer vinyl. 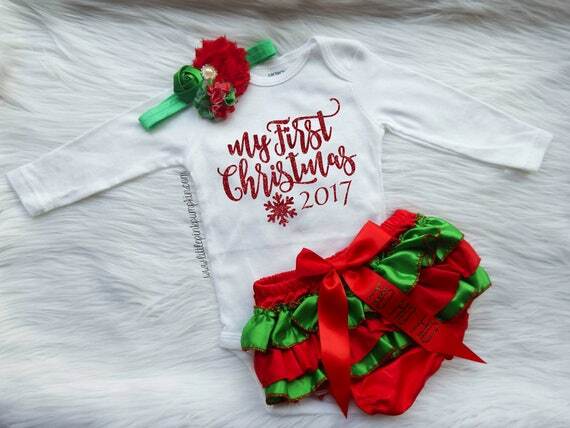 This baby girl onesie is designed with flake resistant glitter vinyl, with the saying, “My First Christmas”. Please include the name you would like on the bib if ordering the 5pc set. ***The 5pc set includes the pictured headband, bodysuit, bib, leg warmers, and bloomers. Each bodysuit is professionally pressed with a commercial grade heat press in order to ensure maximum durability. Each design may be custom ordered to be in a variety of colors as well as style of top (t-shirt, long-sleeved onesie, or shirt.) This may cause a variation in processing time so please send me a message for custom orders before placing the order. Our Custom made Ribbon Tree with My First Christmas is perfect for Babys Christmas Photos or Christmas dinner. We pair our outfit with green stripped legwarmers, a green chiffon bloomer, and a green chiffon flower headband. 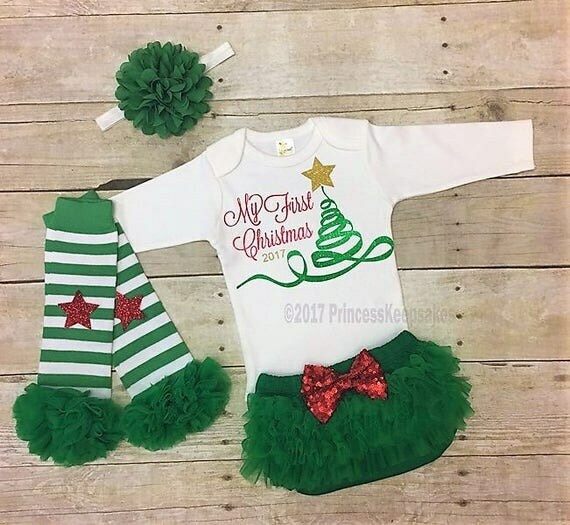 Glitter red and green baby Girl Christmas outfit which is perfect to wear on Christmas day, for a Christmas themed birthday, or as a take home outfit. This My First Baby Girls Christmas set can come with a glitter bodysuit which is made out of 100% cotton. A pair of Santa inspired leg warmers with a red glitter heart and matching red sequin headband can also be included in the set. The red baby bloomers are design with soft red chiffon and are embellished with a red sequin bow which is hand sewn on. 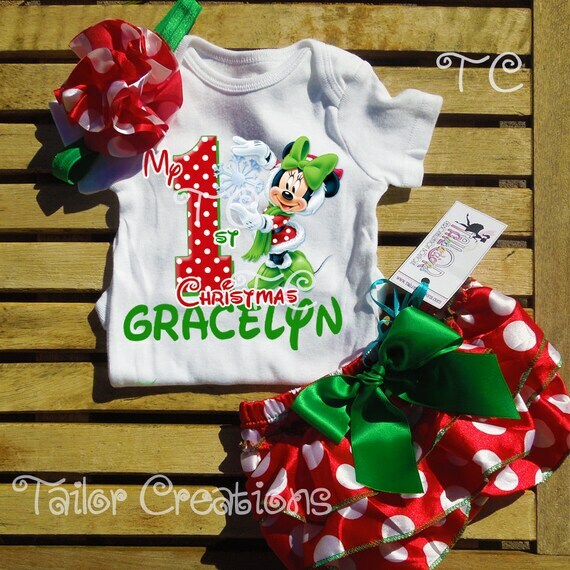 Looking for a personalized Baby’s 1st Christmas Outfit? 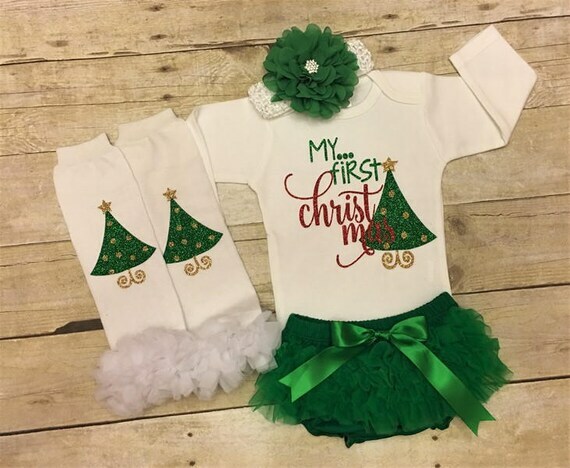 What better way than with a Newborn Christmas Tree Outfit adorned with “My First Christmas”. This outfit comes with the option to purchase the bodysuit alone or with all 4 pieces. If you would like something more custom please feel free to message me. We are able to personalize with your little ones name. 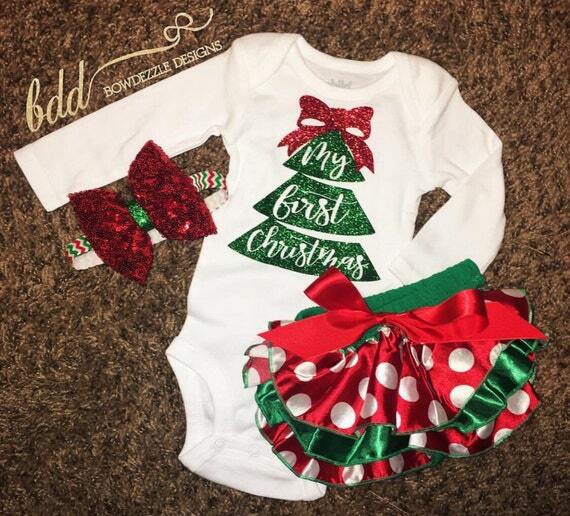 Wow, we have your baby girl completely covered with this 5-piece holiday outfit! 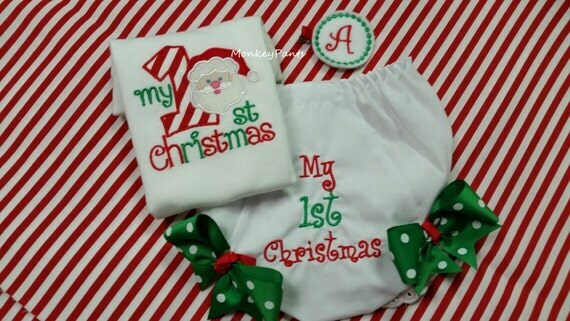 Stating, “My First Christmas”, the colors of the embroidered text are completely customizable, just see below. 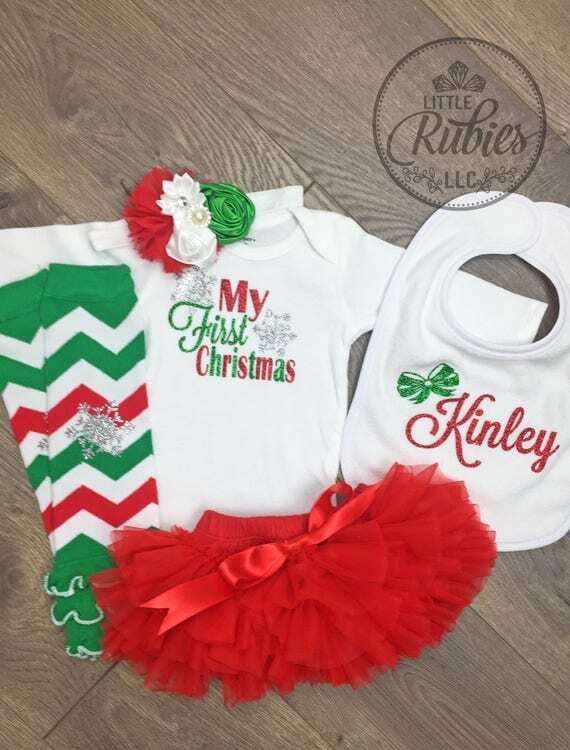 You also get a red/green/white tulle floral headband, adorable chevron leg warmers with tulle ruffle trim, bloomer and tutu if the 5pc set is purchased, also in holiday colors. 100% cotton, white Carter’s brand bodysuit/ Monag or Kavio t-shirt. Girls tshirt has a ruffled collar up until size 6X depending on availability. Both bodysuits and t-shirts are available as both short (SS) and long sleeve (LS). Cotton leg warmers. Sizes newborn to 2T. Made in the USA. 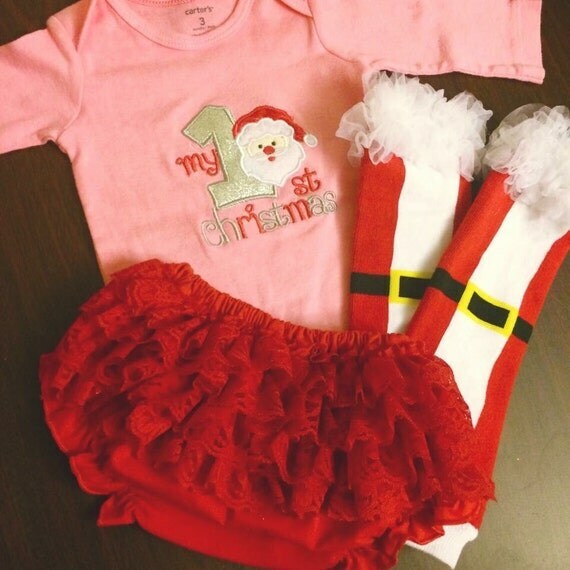 Wow, we have your baby girl completely covered with this 5-piece holiday outfit! 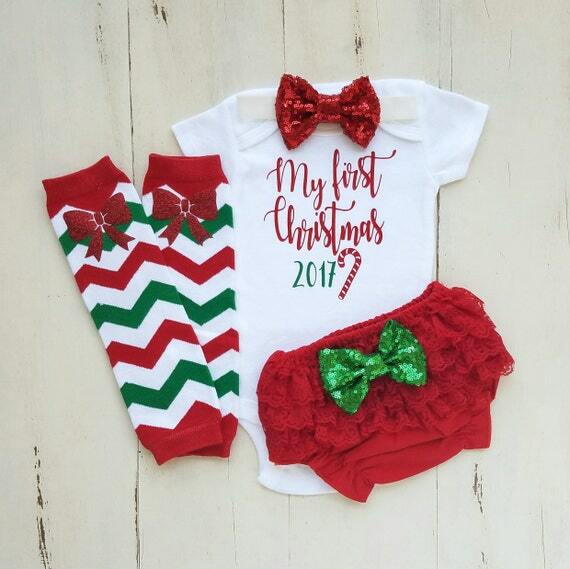 Stating, “My First Christmas”, in sparkly rhinestones professionally heat pressed.. You also get a red/green/white tulle floral headband, adorable chevron leg warmers with tulle ruffle trim, bloomer and tutu if the 5pc set is purchased, also in holiday colors. 100% cotton, white Carter’s brand bodysuit/ Monag or Kavio t-shirt. Girls tshirt has a ruffled collar up until size 6X depending on availability. Both bodysuits and t-shirts are available as both short (SS) and long sleeve (LS). Cotton leg warmers. Sizes newborn to 2T. Made in the USA. 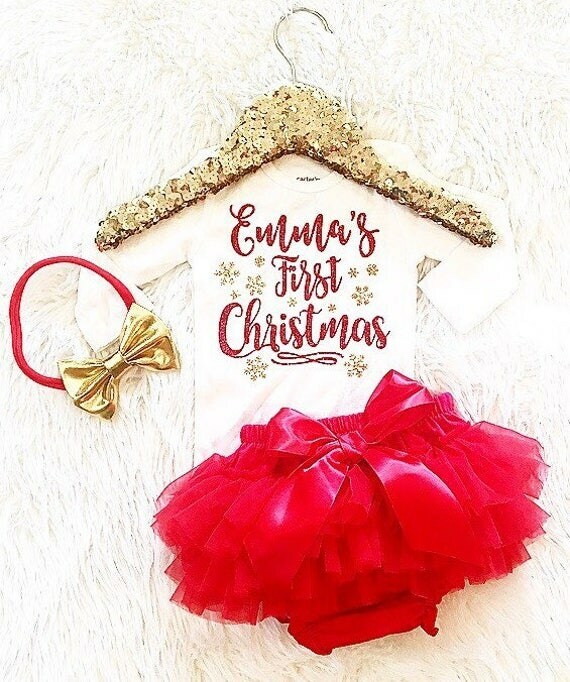 Dress your baby girl in this sparkly set for her first Christmas! Bloomers fit up to size 12months! Select any decal from photos size and edit the wording as you wish and well edit any design you select to match the bloomers. 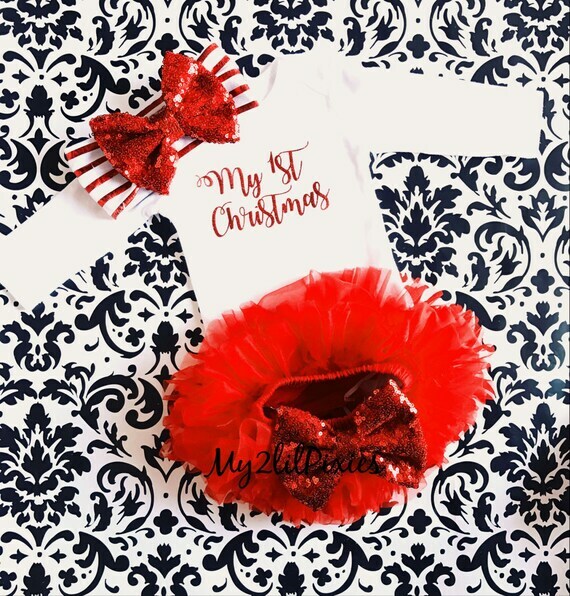 Won’t your sweet baby girl look festive in this 1st Christmas bodysuit and/or diaper cover with a matching initial holiday hair clip? These three pieces will make her holiday wardrobe a little more special and makes great photos! The bodysuit design is an applique, machine embroidered on Carter’s bodysuits for extra durability and will look great after many uses. The shirt is also made with a soft iron-on fabric inside to prevent scratching. All shirts will be long sleeve unless short sleeve is requested. We embroider the design on the diaper cover, too! We ONLY sell the bloomers as a set. We don’t sell the bloomers as a set. My first Christmas outfit. Select the items you would like to purchase in the drop box menu. TOP- Long sleeve white bodysuit with red and gold sparkle lettering. Bodysuits run a tad big please see size chart in pictures. BLOOMERS- sparkle bloomers with gold sparkle sequin in front and layers of red chiffon on the back. HEADBAND- white and red striped band with gold sequin bow. LEG WARMERS- red and white striped leg warmers with gold sequin bows on top- leg warmers are one size fit most. Newborns- Covers entire leg (very scrunched) 6 months- 2t full length. 2t-5t ankle to just below the knee LEG WARMER LENGTH 12 INCHES. This sweet outfit is heirloom worthy. Body suit with adorable 1st Christmas can have Baby’s name embroidered at no additional cost. Sweet Silent Night bloomer is a sweet little reminder to cherish this first Christmas with your little one. Perfect baby shower gift or newborn Christmas gift. As the mom of a NICU grad, I make sure to have embroidery patterns that will work on preemie clothes. Every garment I make is carefully lined on the inside to protect delicate skin. My First Christmas Set with Ribbon Christmas tree!! Adorable Christmas outfit! 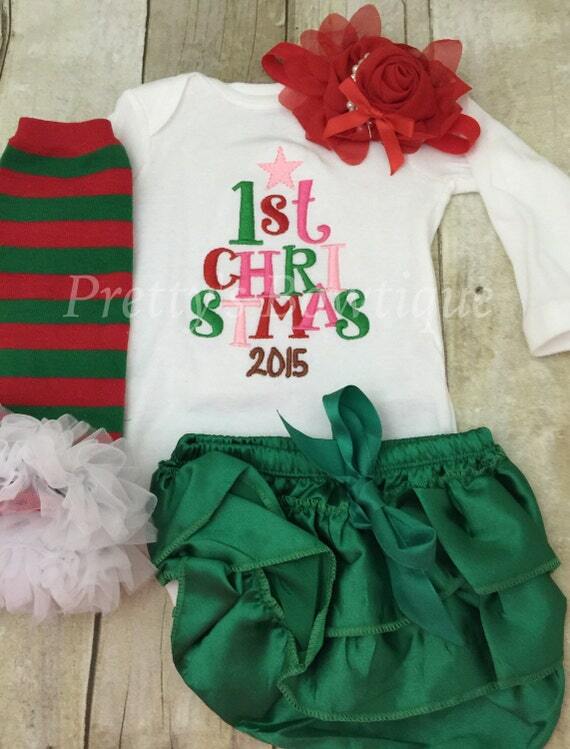 Complete set with cute onesie, headband, leg warmers and bloomers with glitter bow attached. If you would rather have a fluffy red tutu on ribbon just email for details. What a special way to celebrate your baby’s first Christmas. This outfit can be customized many different ways. I can add a name, or do this on a plain white onesie opposed to the pink. I can also add a bow to the back of the bloomers if you prefer. I have also listed options to do item separately. I use Carter’s Brand for the Bodysuit. This listing is for Personalized onesie, Headband and Red bloomer (diaper cover). -The bow in the headband and bloomer is approximately 3 inches. Our tutu bloomers are super fluffy all the way from the front to back, and adorned with a super sparkly sequin bow. This sequin bow on the tutu pulls the whole outfit together by tying in the handmade headband which includes two rosette flowers and another sparkly sequin bow attached to a 15″ headband. This outfit will make your princess stand out no matter what the occasion is. ❤Each bodysuit is professionally pressed with a commercial grade heat press, with the glitter design of your choice, to ensure the glitter will last permanently and never flake. The leg warmers are also pressed adding an extra glittery heart on the knee! 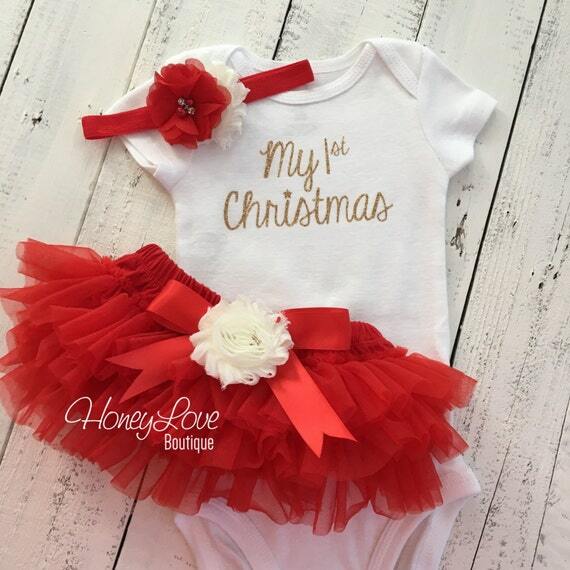 Perfect Baby’s 1st Christmas outfit for any baby newborn through 24 months. 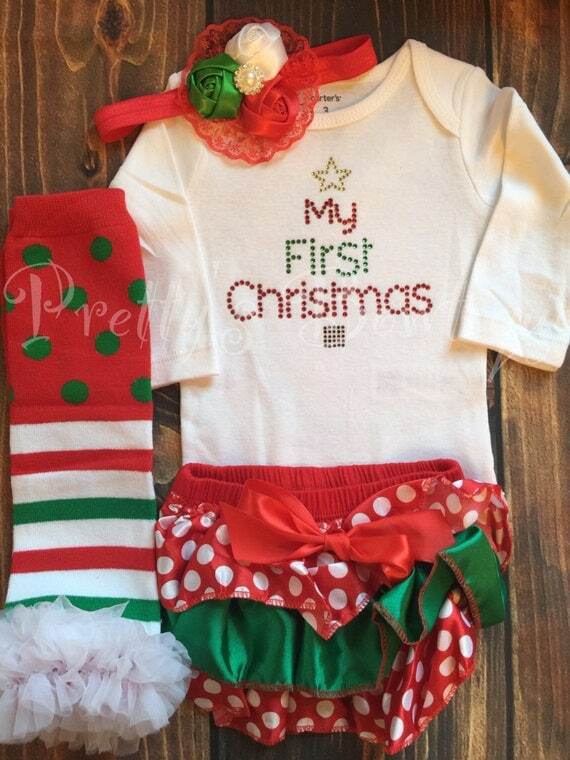 3 piece Set features long sleeve white onesie with “My 1st Christmas ” Red Glitter Lettering. Headband with Red Sparkle bow completes this adorable look. You’ll Also Love These My First Christmas Baby Girl Items!